30 ¼ x 22 in. Son of the illustrator N.C. Wyeth, Andrew Wyeth learned to draw and paint from his father. He had his first one-man exhibition at Macbeth Gallery in 1937, and he became a household name by the 1950s. 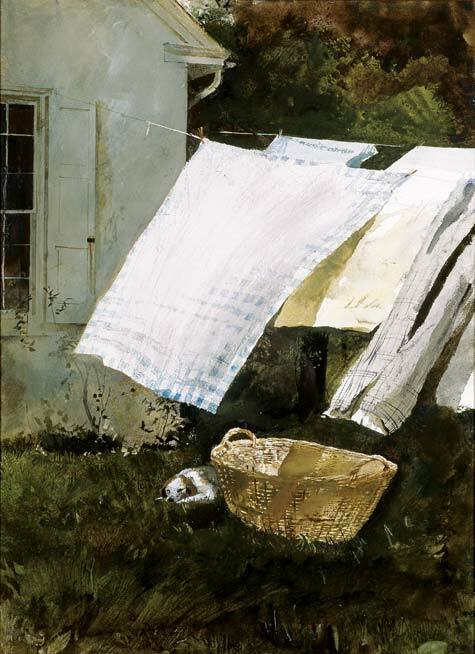 Wyeth's style is characterized by precise realism, undoubtedly influenced by photography in its exactness of detail and use of unusual viewpoints. In Light Wash, the scene is set in Chadds Ford, Pennsylvania and shows the backside of a house, with a laundry line hanging clothes out to dry. A small dog is visible behind a straw laundry basket. This watercolor is a typical scene for the artist not only because it depicts solitude, but also because of his ability to illustrate movement.